Seems like old times. Less than a minute into his first fight in over two years, UFC veteran Drew McFedries backed opponent Bill Hill up against the cage and unleashed a barrage of punches that left Hill out cold on his feet. Hill’s legs were the last thing to go, but as soon as he hit the deck the referee waved off the fight, giving McFedries yet another first-round KO win to add to his resume. McFedries looked the same to me as he did during his UFC run, in both physique and skills. The speed and power of his hands was evident. He looked cut and in great shape, which is amazing considering McFedries said he had lost a total of 50 pounds in preparation for his comeback. When Jeremy Horn came to Chicago to make his return, it was obvious that Horn was a different fighter than he was in his prime. He didn’t look as fluid or as fit, which is to be expected. But with McFedries, there was nothing to indicate that he couldn’t walk right into the Octagon and be competitive. And that is indeed the plan — a return to the UFC. McFedries said he’s ready for one more run in the UFC, and he thinks he is better prepared now than he was during his first stint. In his post-fight interview with cage announcer Ray Flores, McFedries said he has a better understanding of everything it takes to be successful in MMA. Even if he didn’t, the power in both his hands says he still has what it takes to compete at the highest level. When and if he gets the call to return to the big show is undetermined. In the meantime, McFedries is certainly welcome to fight again in the XFO cage, something Chicago fight fans would love to see. Conventional wisdom says he will need at least one more win, against an opponent whose name carries a bit more cachet than Bill Hill. That’s no disrespect to Hill, who is one of Chicago’s most-tenacious warriors, still kicking tail post-40. 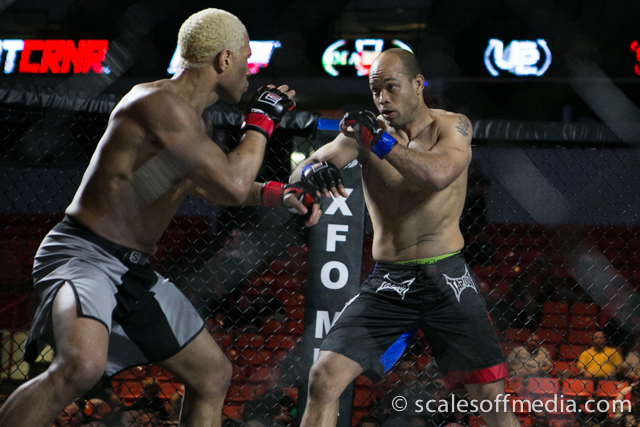 The XFO has been a springboard to the big shows not only for young fighters, but for guys looking to make it back. McFedries is the latest in a list that includes Jens Pulver, Jamie Varner and Sean McCorkle. Here’s hoping we get to see McFedries doing work at least one more time in the Chicago area.